The government is finally taking proactive steps in its commitment to modernize education in India. On Education Day, November 11, it plans to introduce the first batch of the new Aakash II tablets to around 20,000 students. With improved features like a 1 Ghz processor, an Android 4.0 Ice Cream Sandwich interface, Capacitive touch screen all priced at just over Rs 1,130, the device will be available for under $20, making it arguably the cheapest tablet in the world. The government also plans to showcase this achievement at the UN on November 28. A presentation to the effect will be made by Mr. Suneet Singh Tuli, CEO of Canada based Datawind, which bagged the contract to manufacture these tablets on behalf of the Indian Government. According to Mr Hardeep Singh Puri, India’s representative at the UN, the meet may even be attended by the UN Secretary General Ban Ki-Moon. The previous version of the device, which although cheap, was not appreciated by the public and was even rejected by IIT Rajasthan on basis of quality. Keeping that in regard, this time IIT Bombay is being consulted on the Aakash II. 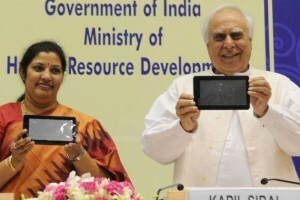 The government plans to buy 5.86 million Aakash II tablets from Datawind at a cost of Rs 1,300 crore and will make them available to students and educational institutes across India in the next 5-7 years roll out time. The low cost and great features of the device will enable easy access of educational and browsing content for students and will further increase internet penetration into the Indian mindset. If successful, it would be a great step forward for the country. Celebrating the launch of the Aaksash II tablets, the ministry plans to invite the president, Mr. Pranab Mukherjee, himself to showcase the tablets to the nation on the occasion of November 11, Education Day.